Japanese-American internees waiting for Registration at the Santa Anita reception center in Los Angeles, California. "It's hard enough when parents drop off kids for the first time and seeing that,"says Osumi, who teaches in Los Angeles. But this was so much worse: In Osumi's school, the new students would be retrieved at the end of the day, and returned home to be quizzed and comforted by their parents. There was no such assurance for children at the border. The border separations also reminded him of something less benign: the separations many Japanese American families on the West Coast experienced in the aftermath of the attack on Pearl Harbor. In the initial days after the attack, Osumi says, "many of our fathers were picked up by the FBI immediately after Pearl Harbor and taken without notice, where they were going, and how long they'd be gone." Shortly after Pearl Harbor, Franklin Roosevelt signed Executive Order 9066, which authorized the US military to round up all Japanese and Japanese Americans who lived on the West Coast. The entire West Coast, from the Pacific Northwest down to San Diego, was declared a military zone, and the Japanese American families were ordered to relocate to a series of concentration camps that were mostly scattered across inhospitable parts of the Western interior. The reports from the border this week, Noguchi says, sent a collective shudder through many Japanese American communities around the country. He knows that children who were in the camps during the war grappled with that trauma well into adulthood. "We know that there have been impacts on individuals psychologically because they'd been forcibly removed from their parents, so there are direct parallels" to the border separations. David Inoue is executive director of the Washington, DC-based Japanese American Citizens League. "This is something that's deeply personal for many of us," he says. "The incarceration experience where families were very similarly torn apart as they were put in the camps and the lasting scars that many people carried from that, has led to deep emotional and visceral reactions" to the border separations. Adding to the trauma, says Rick Noguchi, was the fact that many white Americans watched the removal of their fellow citizens and did nothing. "From what I understand, there were very few groups and people who were opposed to Japanese Americans going to camp." Aside from some notable objections from the American Quaker community, "people were pretty passive about it and didn't take action to prevent it from happening." Why is why, all three men say, it's vitally important to protest the treatment of migrant families at the Mexican border today. "I never thought we'd have to deal with camps again, as a Japanese American; it was always in the abstract" Tony Osumi says. "But this is a wake-up call. This is a time for people of good conscience to speak up." David Inoue, of the JACL, says many Japanese Americans believe this support is mandatory. "To target people, as this administration is doing right now with the immigrant population--with this border activity or the Muslim travel ban, targeting Muslims as a group—is exactly what happened to Japanese Americans during World War II. And we're here to stand with groups that are now being targeted similarly." 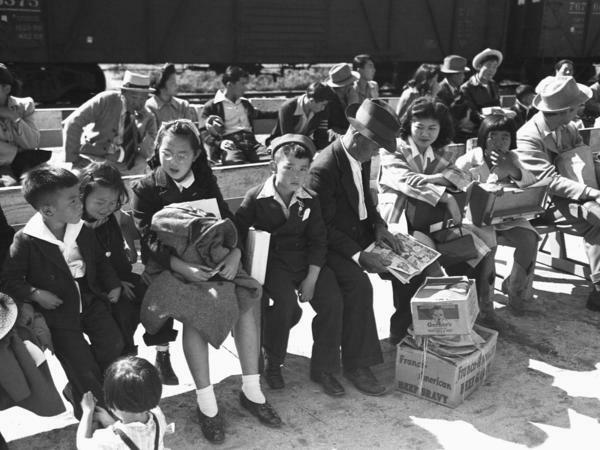 Members of the Japanese-American community were some of the most vocal advocates for families separated at the U.S.-Mexico border. Karen Grigsby Bates from our Code Switch team tells us why. 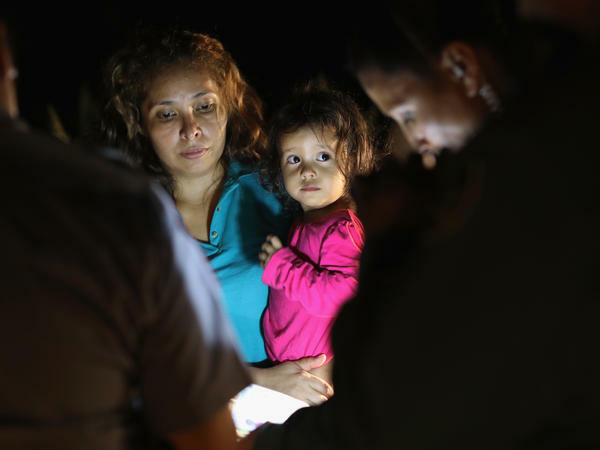 KAREN GRIGSBY BATES, BYLINE: Tony Osumi has been watching the news for the past several days, and says he was horrified to see the images of wailing children being pulled from their parents' arms and led away at border checkpoints. TONY OSUMI: As a parent, I was aghast. As a schoolteacher, separating children - it's hard enough when parents drop off kindergartners for the first time and seeing that. It's heartbreaking. BATES: Osumi says the separation of Latino families at the border this week has echoes that affect many Japanese-Americans whose families were incarcerated in American concentration camps during World War II. OSUMI: Many of our fathers were picked up by the FBI immediately after Pearl Harbor and taken without notice where they were going and how long they'd be gone. BATES: Soon after, President Franklin Roosevelt's executive order 9066 authorized the military to round up all Americans of Japanese ancestry on the West Coast. It forced them to leave their homes and relocate to barren barracks mostly in the Western desert. One is on display at the Japanese American National Museum in downtown Los Angeles. RICK NOGUCHI: So this barracks came from Heart Mountain, Wyo., which was one of 10 concentration camps during World War II. BATES: That's Rick Noguchi, the chief operating officer at the museum. He says this week's news of family separations sent painful reverberations through the Japanese-American community, especially its older members. From personal experience, Noguchi worries that the trauma Latino families are suffering currently can last for generations. NOGUCHI: We now know that there have been impacts on individuals psychologically because they were forcibly removed, or they didn't see their parents. So there are direct parallels. DAVID INOUE: The Japanese experience during World War II is something that we believe must be remembered by this country and remembered in order that we don't repeat any of those same mistakes. BATES: David Inoue is executive director of the Japanese American Citizens League, a civic group that says advocating for the civil and human rights of others is critical, especially now as elders who experienced the camps are dying out. But all three men say remembering is only part of the solution. Recognizing that such measures were a mistake is also vitally important. BATES: In a watershed moment on August 10, 1988, then President Ronald Reagan addressed several members of Congress, Japanese-American activists and former camp internees. REAGAN: This action was taken without trial, without jury. It was based solely on race for these 120,000 were Americans of Japanese descent. BATES: At the conclusion of that speech, Reagan signed HR 442 which gave an official apology and reparations to surviving internees. Unlike the Japanese-American internees, the migrant families at the border are not citizens. But teacher Tony Osumi says all Americans should insist that these families be treated humanely. OSUMI: As Japanese-Americans, we have to use our history to fight for others. We have kind of a responsibility to speak out, to stand up and to support others who are going through anything even remotely similar. BATES: Karen Grigsby Bates, NPR News. (SOUNDBITE OF GUCCI MANE'S "BINGO (INSTRUMENTAL)") Transcript provided by NPR, Copyright NPR.